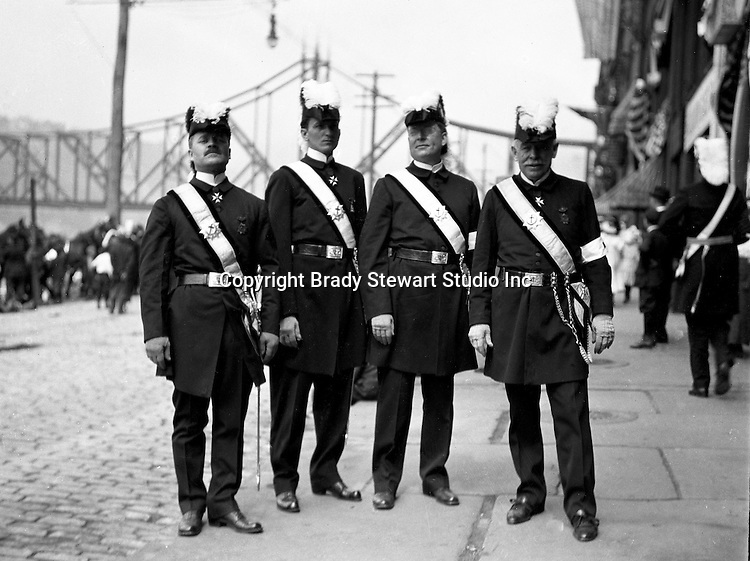 Pittsburgh PA: Homer Stewart (left) and brother Masons before the annual parade on Water Street - 1904. Wabash Railroad Bridge is in the background. Homer Stewart, Brady Stewart's father, was prominent in frateral circles. He was a charter member of the Fort Pitt Lodge Free and Accepted Masons; Mount Moriah Council, Royal and Select Masters; 32nd degree member of the Pennsylvania Consistory, Ancient Accepted Scottish Rite, Valley of Pittsburgh; and member of the Syria Temple, Ancient Arabic Order Nobles of the Mystic Shrine.